My daughter and son-in-law are visiting from the west coast and we hosted a big gathering yesterday to give relatives and friends a chance to see them. It was a wonderful, wonderful day. I filled the house with flowers and since it was Monday, I had planned to join Cathy’s weekly challenge In A Vase On Monday, but could not find time until this morning to photograph the arrangements. 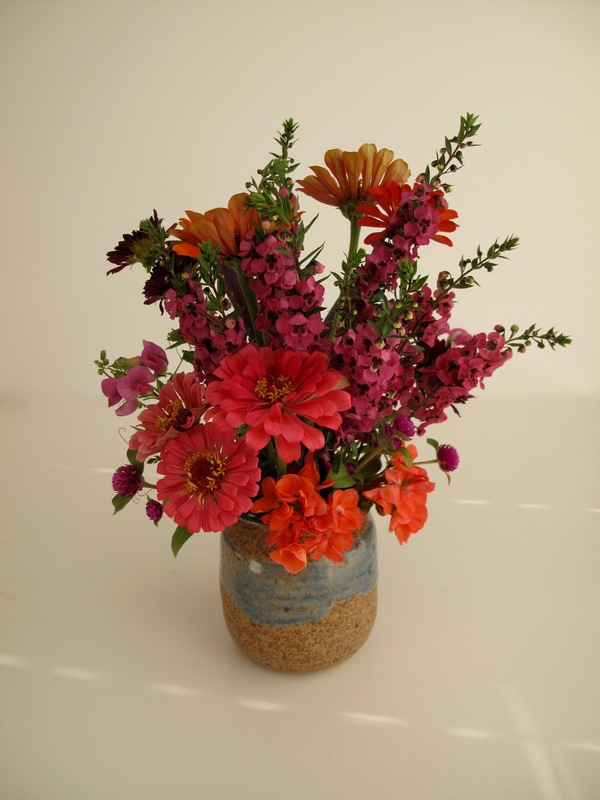 There were literally a dozen vases of mostly zinnias, angelonia and obedient plant scattered around. I counted them this morning when trying to figure out if I wanted to carry them all upstairs into the studio where the light might be more conducive to picture taking. The answer was no, so I just picked up a couple to share. 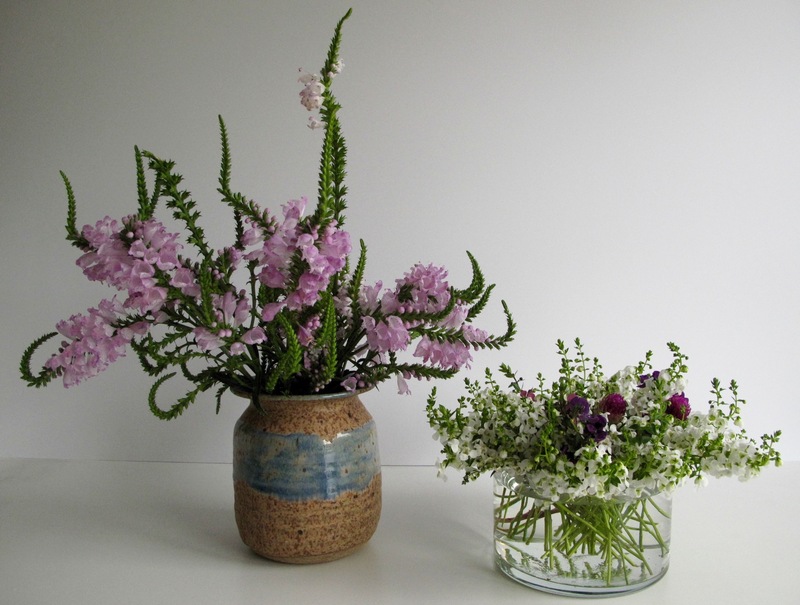 Since I featured Physostegia virginiana last week I should have chosen something different but these two just happened to be sitting next to each other on the counter. I like the structure of Physostegia virginiana in this arrangement with the repetition of curves, angles and lines among the flower heads. 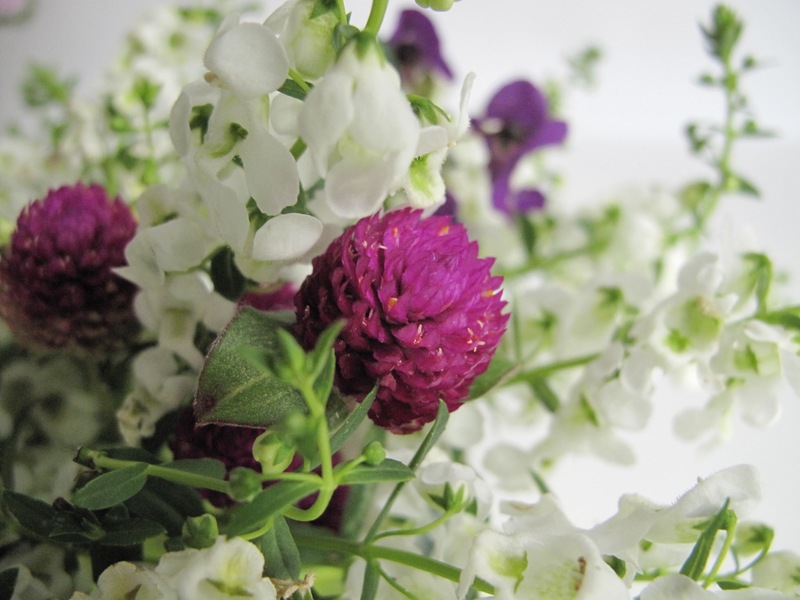 Leftover short stems of Angelonia and a couple of Gomphrena globosa (Globe amaranth) collected into a round, glass dish made a simple, but attractive design. I think it is most interesting viewed from above. Thanks to Cathy at Rambling In The Garden for hosting. Discover what she and others are placing In A Vase On Monday, where the goal is simply to fill a vase using materials gathered in one’s own garden. 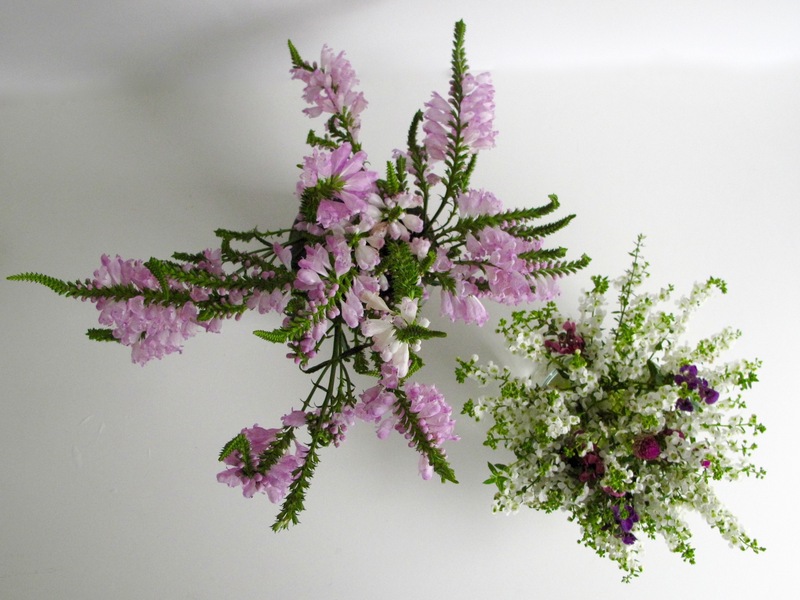 This entry was posted in garden and tagged angelonia angustifolia, flower arranging, flower design, gomphrena, in a vase on monday, nature photography, Physostegia virginiana (Obedient Plant) on August 18, 2015 by pbmgarden. 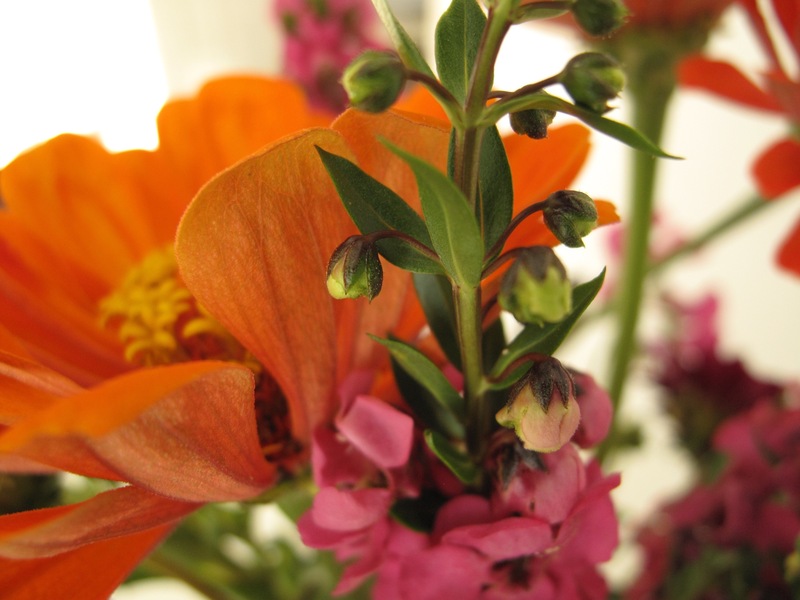 Zinnias are usually reliable but this year very few of the seeds germinated. The plants that grew are very strong though and the colors, vibrant. 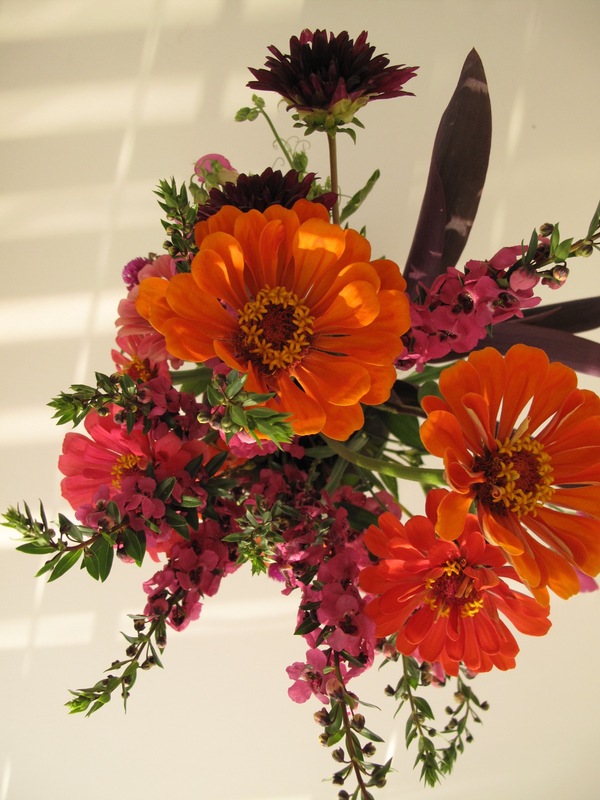 Several of my favorite deep orange ones opened yesterday so they form the basis of this week’s arrangement. 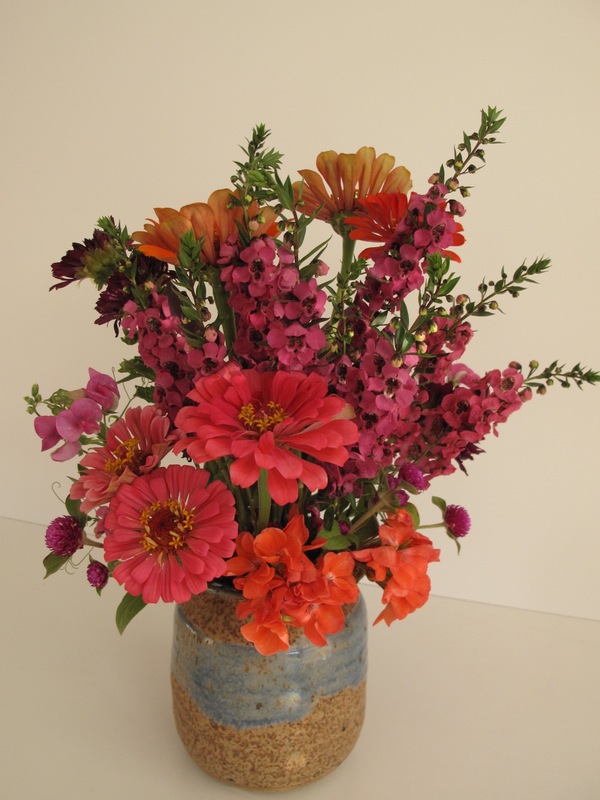 I added a couple of pink zinnias and a salmon one as well, all that were blooming today. 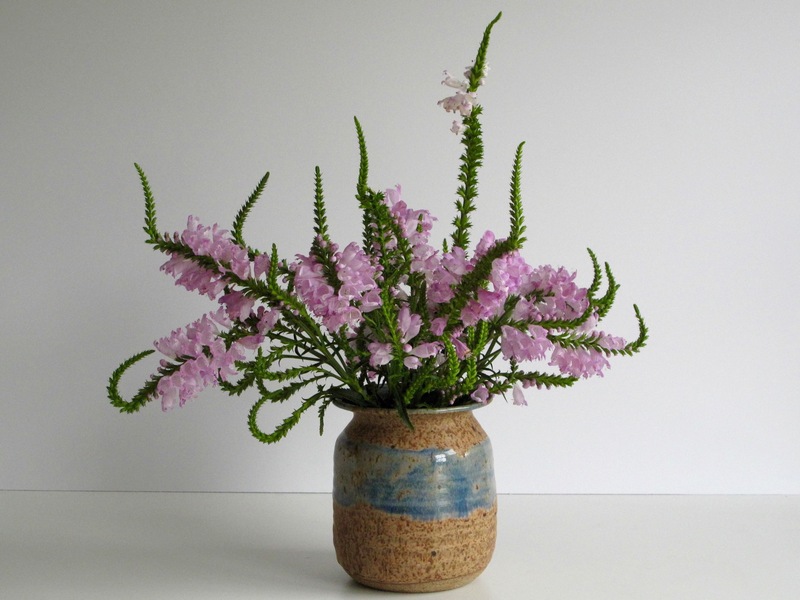 There is plenty of Angelonia blooming, making it an easy choice for filler flowers. 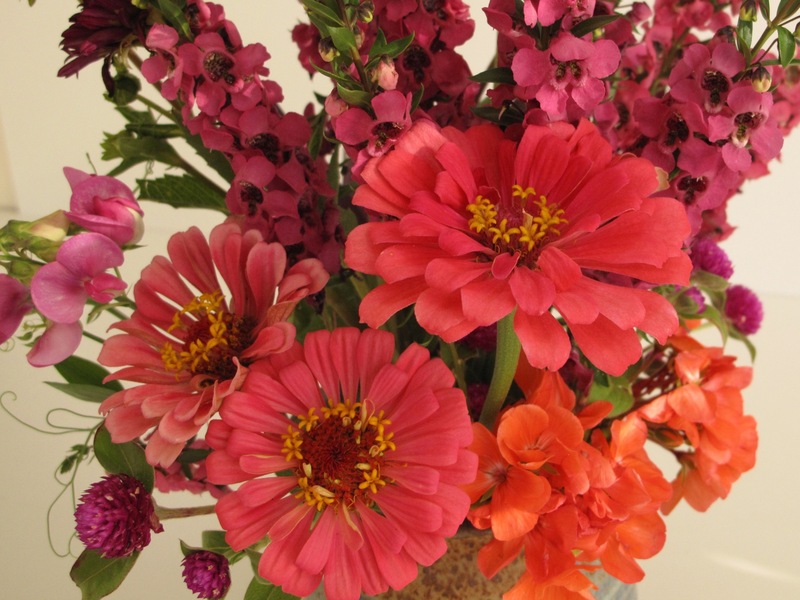 I chose the dark pink Angelonia and I really like the way it pairs with the orange zinnia, but in retrospect white would have provided better contrast in the overall arrangement. 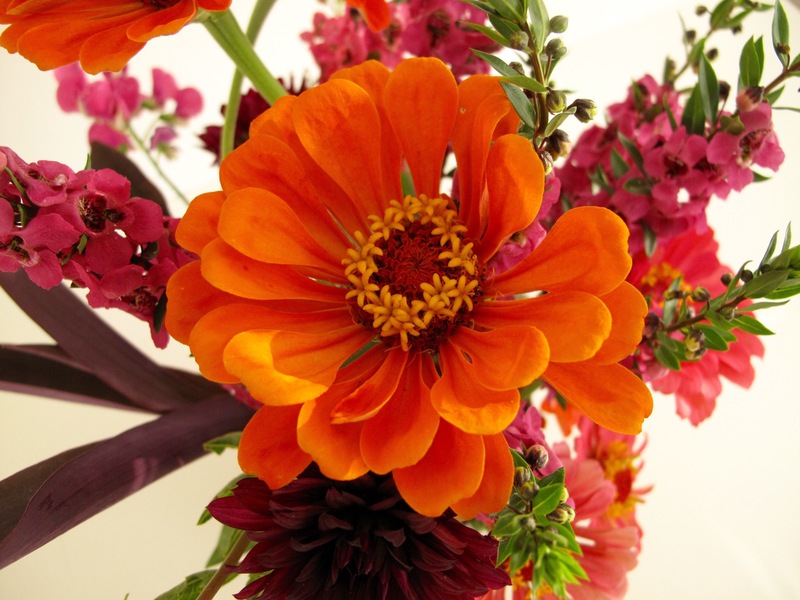 The similarity of color tone in today’s flowers made it hard to achieve a good range of light and dark in the design. 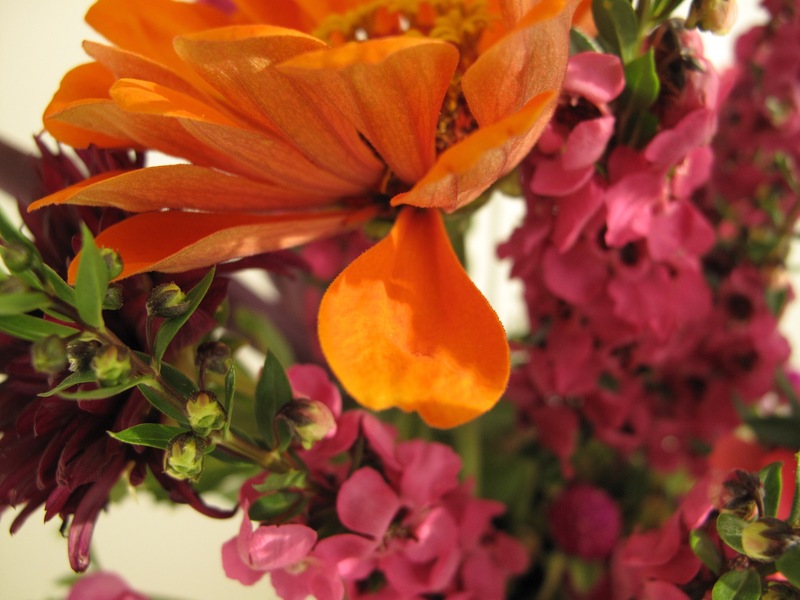 It is easier for me to see this when I squint at photographs than while arranging the flowers–something to keep in mind next time. Dahlias are blooming sporadically. 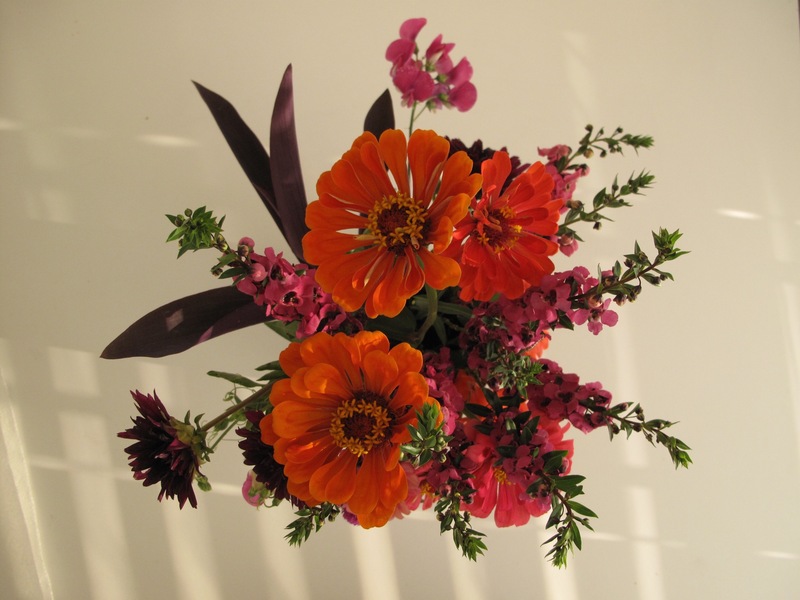 I was able to find a couple of dark burgundy ones as well as a sprig of Purple heart foliage. 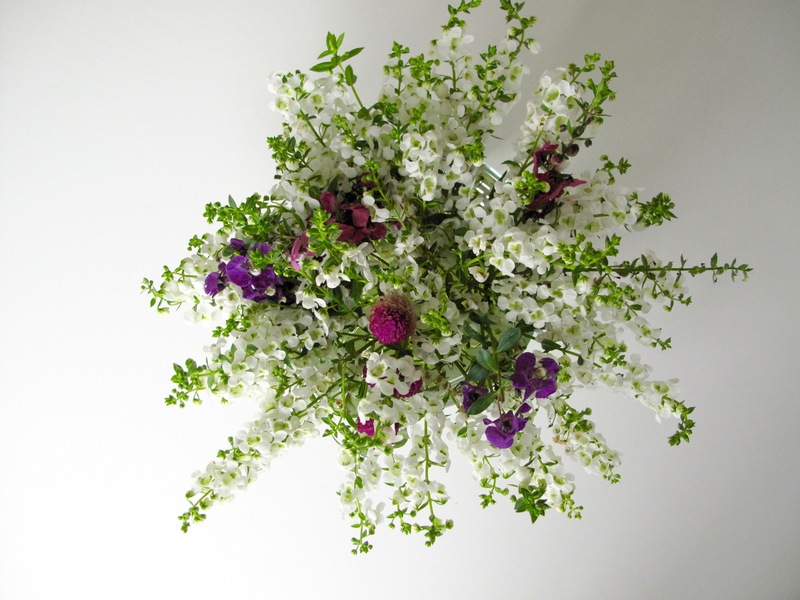 Their contribution to the design is best observed when viewing the vase from overhead. I also included a couple of stems of Gomphrena or globe amaranth from a patio planter. The Gomphrena seems to love the heat. A passalong Perennial Sweet Pea, which has bloomed well all summer, and a salmon-hued Pelargonium, which has not, round out the choice of flowers. 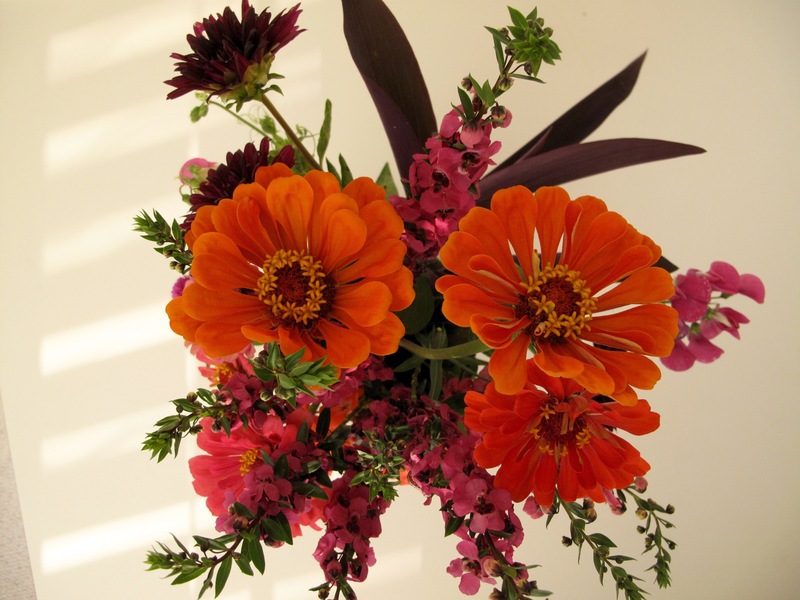 This entry was posted in garden and tagged angelonia angustifolia, dahlia, flower arranging, flower design, gomphrena, in a vase on monday, nature photography, pelargonium (geranium), Tradescantia pallida (purple heart), zinnia on August 3, 2015 by pbmgarden.